It's so lovely you stopped by because I've been away for a bit. The end of school with all the paper work, field trips, and making memories doesn't leave much time left for crafting, but it's summer now--beautiful summer with it's gift of time. Taping watercolor paper to an old cutting board with plain old painter's tape is the first step. Then grab a wide, flat watercolor brush and paint water on the front until it is completely wet. Load up your brush with blue watercolor. I used Winsor and Newton Cerulean. Go back and forth across your watercolor paper keeping your brush full of paint. I also use gravity to help out by putting something under the top end. Take a Kleenax and wad it up. Press down on the watercolor lifting up paint and move it a bit until it is cloud like. I used Payne's Gray by Winsor and Newton to add some shadow, but I've had some luck with a darker shade of blue and purple, too. For more constrast I watered down some Liquidtex Gesso and dabbed that on the clouds, too. When all was dry I stamped my Bitty Balloon Stamp on the corner using Memento Tuxedo Black Ink. 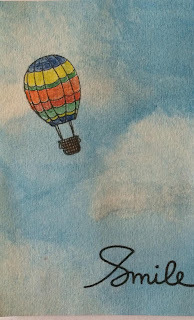 I used Caran D'ache colored pencils to color in the balloon stamp. (My husband bought them on our honeymoon and I've sort of confiscated them.) I used white first to make the colors on top brighter. 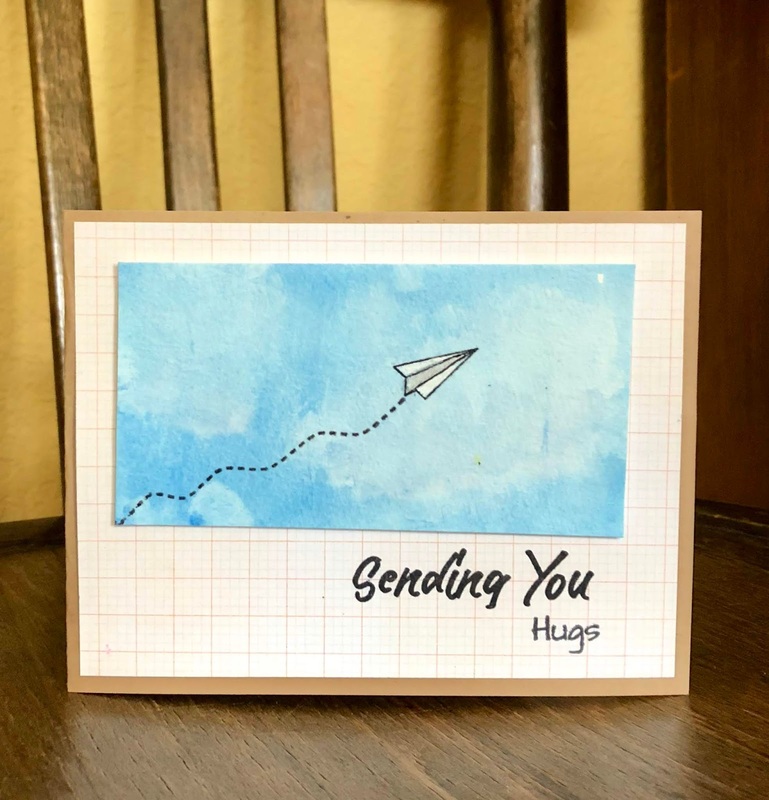 I finishe the card with a sentiment from Paper Smooches called Scripty Sayings. This next card features an adorable paper airplane from my Love Letters Stamp Set. 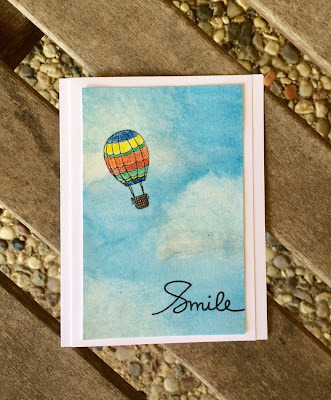 Making a watercolor sky is easy peasy! I challenge you to try it. I'd sure love to see what you make. You can do it! Want to peek at my Etsy store Pink Bunkadoo? Click here. Never miss a post! Subscribe today. © 2017 by Pink Bunkadoo. Simple theme. Powered by Blogger.